This entry was posted in Blog on September 24, 2012 by Joan Murphy. Can Talking Mats help young people set targets? The project found that Talking Mats, when combined with ICF-CY, is a powerful tool with the potential to greatly enhance the nature of partnerships between pupils, parents and professionals. 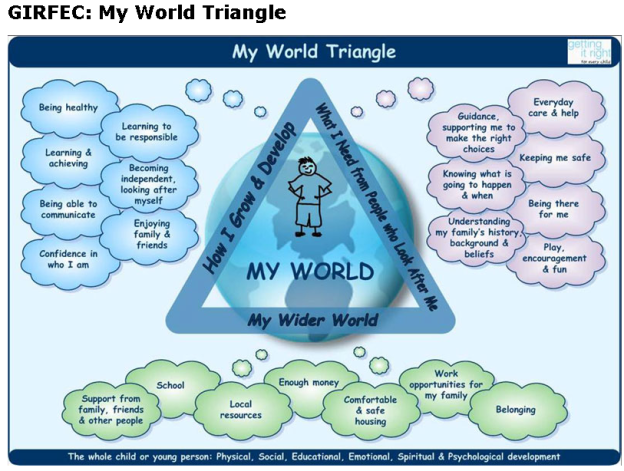 This entry was posted in Blog, Children and young people, GIRFEC, Participation, Research and tagged Children, GIRFEC, Participation, Talking Mats, Young people on September 18, 2012 by Joan Murphy. This entry was posted in Blog on September 12, 2012 by Joan Murphy. Getting it right for every child is a national programme to improve outcomes for all children and young people in Scotland. It threads through all existing policy, practice, strategy and legislation. New Scottish Government legislation will be introduced to parliament in 2013 which will embrace the key principles of the GIRFEC approach to all of children’s services. Talking Mats and GIRFEC: Leeanne and I ran 2 seminars which described how we have worked together to develop symbol sets based on the GIRFEC model to be used with the Talking Mats Framework. We illustrated the seminar with some moving case examples of how Talking Mats has been used to get the views of children at risk. We also discussed plans for future Talking Mats developments and training. This entry was posted in Blog, Child protection, Children and young people, Participation on September 4, 2012 by Joan Murphy.